QMK is a very popular framework for custom keyboards. It has ample possibilities, providing hobbyists and professionals alike the ability to customize a lot more about keyboards than just the hardware. However, given any microcontroller, there’s only so much functionality you can fit on it. So far, I’ve used the ATmega32U4 microcontroller in my builds. It’s the microcontroller that’s supplied with the Arduino Pro Micro, one of the more popular microcontroller chips for keyboard builds. On the datasheet for the ATmega32U4, you can find that it has 32K bytes of in-system self-programmable flash memory. This means that any program you want to flash to it can have a maximum size of 32KB. The bootloader also takes up some space, which is about 2KB. It’s not easy to find how much memory you need in order to add any given feature, so with this article I intend to find the answer. What features are enabled by default? I have followed the Complete Newbs Guide To QMK in order to get a development environment running. Then, I followed the Getting Some Basic Firmware Set Up guide (part of the Hand Wiring guide) in order to make firmware with minimal configuration, in order to minimize the effects. I added my own keymap by copying the /keymaps/default/ directory in the newly made project to /keymaps/test/, and added an empty rules.mk file that I’ll need for overriding keyboard settings with later on. Throughout this post, I used Windows 10, using avr-gcc version 5.4.0. You may update the toolchain by running util/msys_install.sh. It won’t hurt to do so: newer avr-gcc versions may be able to further optimize the firmware size. The target microprocessor is an ATmega32U4 with a Caterina bootloader. Compiling this basic setup with make <project_name>, or in my case, make thomasbaart_test:test, results in the message The firmware size is fine - 21340/28672 (7332 bytes free). In other words, the most basic setup without any additional features costs a little over 21KB. Keep in mind, there are some features enabled by default, so this isn’t all that bad. The documentation Configuring QMK states that each feature can have a default setting, possibily defined in one or more of four levels, from lowest to highest priority: QMK default, Keyboard, Folders (up to 5 levels deep) and the keymap. This means that QMK provides for some default settings. If a hardware maker decides to provide a feature as default, he or she can do so in the keyboard folder. If a hardware maker has multiple revisions of a board, such as one with LEDs and one without, then the feature can be assigned a default in a folder within the keyboard folder. And finally, the end user has the final say by overriding those defaults. All of this happens in config.h and rules.mk files. /quantum/template/avr. The config.h and rules.mk files here provide the base defaults for this keyboard. The hardware maker will set up these defaults for you. /keyboards/thomasbaart_test/revisions/rev1/. They’re not added by the default script, but can provide defaults depending on which revision of the keyboard you have. The hardware maker will set up these defaults for you. /keyboards/thomasbaart_test/keymaps/test/: Your own keymap. I named it test, but you can choose any name you’d like. It looks like only three features are enabled by default: mouse keys, extra keys and the console. You can find a complete list of features in the QMK documentation. It looks like all other features are disabled by default. Not all the features listed in the documentation have an impact on the firmware size, though they’re useful to know about. I added a rules.mk file to my keymap to add the extra flags, and modified the config.h with the suggestions above. 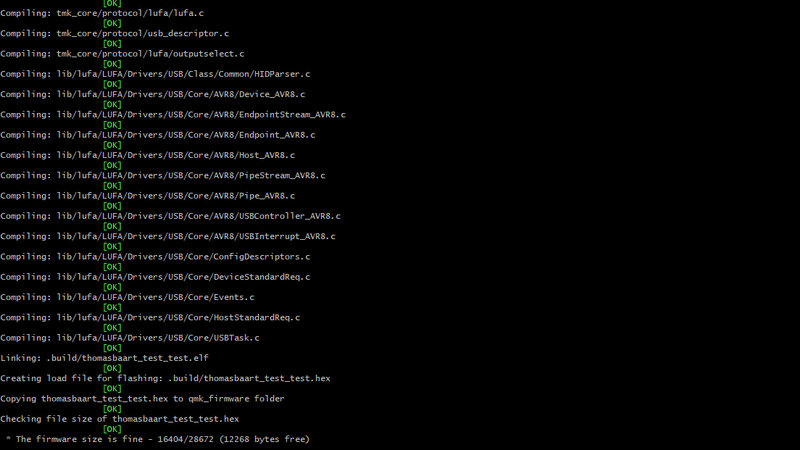 Now let’s compile the barebones sample again. This time, the result says The firmware size is fine - 19536/28672 (9136 bytes free). This tip alone brought the size down from 21340 bytes to 19536 bytes, saving 1804 bytes, about 6% of the total flash size! Furthermore, it’s suggested to disable features you’re not using, like COMMAND_ENABLE or MOUSEKEY_ENABLE. The tip to define DISABLE_LEADER does not apply anymore, since the Leader key has been moved to a feature instead of being in the QMK core. There are more features that can be disabled, per the section Features That Can Be Disabled in the Configuring QMK documentation. In the table below, I’ll note how much space can be saved per disabled feature, and also how much space each enabled feature will cost. The sizes provided are with link time optimization enabled and with debugging statements disabled (see above). Each time, only a single feature was enabled; all the defaults as noted above were also disabled, resulting in a base size of 12220 bytes (16452 bytes free). The savings or costs from toggling features may not add up completely: some functionality is shared or depends on other features. The sizes are supposed to give an indication given an ATmega32U4 microcontroller with the Caterina bootloader and compilation with avr-gcc version 5.4.0, and thus may vary in your setup. If a value is negative, toggling it with the statement in the “How to use” column will save space, if the value is positive, it’ll cost space. (1): Flags are disabled because of incompatibility with link time optimization. (2): The noted size is for all enabled RGBlight animations. You may enable individual animations instead, saving considerable space. (3): I encountered compile time errors while implementing the samples that I wasn’t able to fix within a reasonable amount of time. Your mileage may vary. (4): The thermal printer should be supported, but wasn’t documented. Finding out how it works is not within the scope of this post. If you decide to use RGB Matrix functionality, the documentation lists some effects that can individually be disabled which may save space. In an additional comment by Drashna, you may be able to save more space by flashing another bootloader to your microprocessor. The Teensy Halfkay bootloader and the Pro Micro’s Caterina bootloader seem to require a few workarounds by QMK, adding to the required firmware size. There are numerous ways to save space, the easiest of which is to enable link time optimization. You might be able to toggle some features off when you don’t use them. If you haven’t already, take some time to check the version of your compiler. Updating it may provide some quick-win space savings.